When I found the description of Mary’s house (see: Mary moves her house) I wanted to know more. Why was the house sold? Just who was William Austin? I always wondered how long the Colberts had lived on 121st Street and why they moved – to Bronxville in Westchester County. Land records can be found at 66 John Street so I went there. I knew the block and lot number (1808 – 41) so I was able to find the old records pretty quickly. As I went through them, I found them confusing – referees and people selling and selling back to each other – what was going on? There was a nice map in the beginning of the book and I could see that Mary’s lot straddled two old farms that had been overlaid with the new Manhattan Grid that had been established in 1811. In the 1850s the properties were being “lotted” and partitioned and sold but there was plenty of open land. Mary's lot was number 41. Lots 40, 41, 13, and 13 1/2 were under dispute. The names are of the owners of the farms that were there at the time the grid was created. I decided to go to google books and check out some of the names I had found. Up popped Austin v Ahearne et al. As I read the case I saw the names of the “et al” – the tenants of Ahearne. They were : Spear, Wright, Hickman and COLBERT! The case was full of legal terms, like “attornment” and “ejectment”. What had happened? Was there more information? Yes – in the New York County Clerk’s office, Old Records Division. They have the original case file, folded and wrapped in a ribbon, unopened for at least 100 years. Fragile pages crumbled as I opened them. I had to take digital pictures because the records were too fragile to photocopy. Mary's lawyer wrote "exceptions" to the findings of the referee. So what had happened? 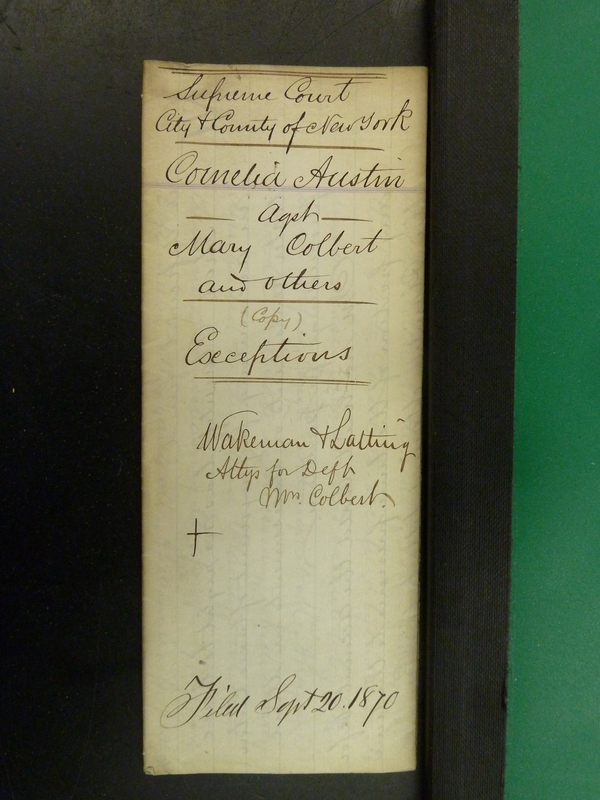 I’m still trying to sort it out, but basically – two women, Cornelia Austin and Margaret M. Ahearne (no relation to us) each owned 1/2 of an undivided interest in property that Margaret had leased to 4 tenants: Charles Spear, Amelia Wright, Nicholas Hickman and Mary Colbert. In 1869 Cornelia filed a lawsuit to eject the tenants. That seems to have been settled when they “attorned” – acknowledging her as their landlady. I still can’t figure out if they had to pay more rent. I do know she wanted to raise Mary’s rent to $100.00 a year, from $30.00 a year. …Margaret M. Ahearne executed leases of these lots to four tenants, and that she and her tenants refused to acknowledge any rights of the plaintiff, Austin in the premises. She accordingly began suits of ejectment against Mrs. Ahearne and the tenants, two of whom recognized her claim and became her tenants also, while a third, Mary Colbert, who had resisted her demand, was nevertheless allowed, from motives of humanity, to remain…. After the ejectment case was worked out, Cornelia filed another lawsuit to partition the property. The court seemed to say that it was too complicated to partition and that it should be sold. I wonder what it was like for my great great grandmother – she could not read, although her daughters and her son-in-law could. She had to hire an attorney to fight the ejectment and then the partition. In one document, her lawyer, Abram Wakeman, told the court that she was infirm and had no way to support herself without her house. It’s possible that Mary had hoped to buy the property when she’d saved enough money. If it went to auction she wouldn’t have a chance. Mary's lawyer represented her in court. The case eventually went to the New York State Court of Appeals. 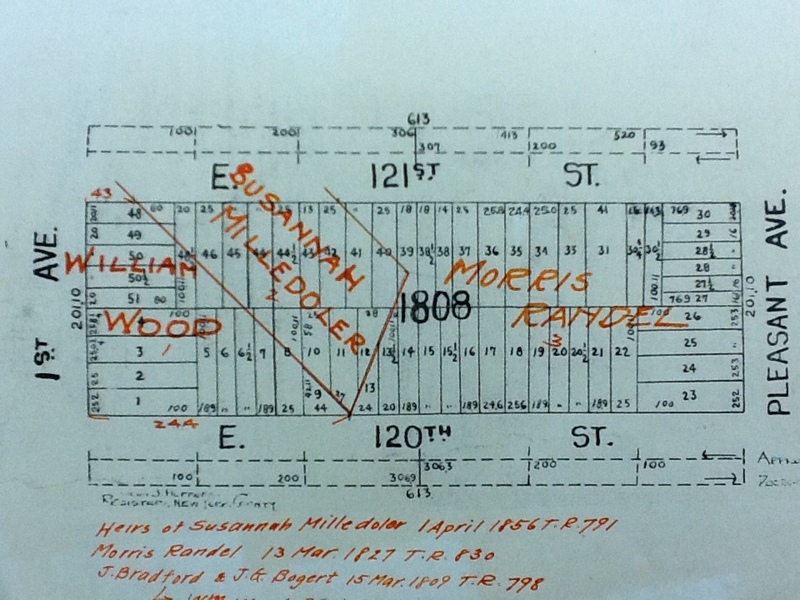 In the end, the lots, including the houses, sold at auction for $250.00 – the buyer? William Austin, a relative of Cornelia’s. 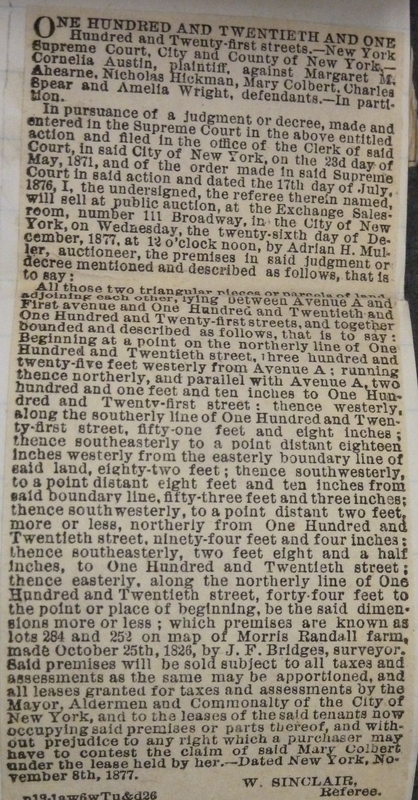 Newspaper ad for the sale of the properties. Note Mary Colbert is mentioned in the last sentence. 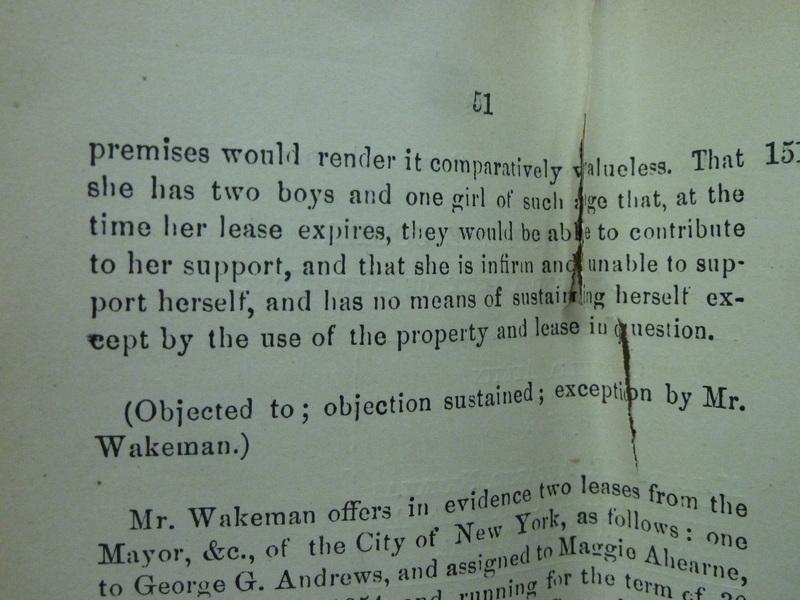 When Mary’s lease ended on April 1, 1880, she had to move – but why Bronxville? Probably because her next door neighbor, Nicholas Hickman, also caught up in this lawsuit and whose lease ended a few months earlier, had moved there. The Colberts didn’t stay long, but returned to New York, not far from East 121st Street, by the fall of 1880. But something had changed: From 1865 to 1880 city directories and the census show that Mary and later her sons and son-in-law were in the milk business. After they returned to New York there is no more mention of milk. Now my great grandfather and his brother are usually shown as drivers and their brother-in-law as a truckman, expressman, or stevedore.